For nearly 40 years, unions representing police and firefighters in New York State have been entitled to seek compulsory binding “interest arbitration” of contract impasses, a form of dispute resolution not available to most public employees outside the public safety field. County and municipal government leaders have sought to end or reform this system on the grounds that arbitration unduly favors unions, resulting in unaffordable salary increases while perpetuating costly work rules and benefits. Excluding step increments and longevity pay, arbitrators awarded base salary increases averaging 3.6 percent a year from 2003 to 2007, decreasing to 3.3 percent from 2008 to 2012. Only four out of 136 arbitrations—including just one since the latest recession—included a pay freeze in any year. Most employers sought cost savings on health insurance benefits, but less than half the arbitration awards included such changes. Arbitration awards filed with the state between 2003 and 2012 involved 104 different bargaining units, roughly 25 percent of the total number of state and local unions eligible for arbitration during this period. 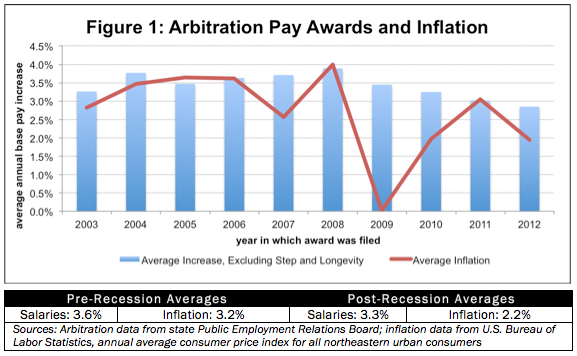 Comprehensive data for negotiated settlements are not readily available from PERB—but it would not be surprising to find that collective bargaining during this period produced salary increases similar to those awarded by arbitration panels, since (as explained below) arbitrators base their awards largely on settlements in “comparable” jurisdictions. Nor is it surprising to find that arbitration was not needed to resolve three-quarters of police and firefighter contracts renewed over the past 10 years. After decades of experience with arbitration in New York, labor and management both know what to expect from it. By settling on terms similar to what would result from arbitration, they can avoid the delays and added legal expenses associated with the process. Rather than risk a more generous arbitration award, local officials agree to contract terms they otherwise would have resisted. Compulsory interest arbitration is the final step of the impasse procedure for police officers, fire fighters and other employees including state troopers, forest rangers and other state agency law enforcement services officers; state correctional services security personnel; investigators in district attorney’s offices; local deputy sheriffs who spend more than 50 percent of their time on law enforcement duties; and some transit workers. Once negotiations reach an impasse and cannot be resolved in mediation, either party may petition the Public Employment Relations Board to refer the dispute to a public arbitration panel. One member appointed by the employer. One member appointed by the employee organization. One public member selected jointly by the parties, who serves as chairperson. Take written and oral testimony and other evidence. Upon joint request of the panel members representing the parties, refer an issue back to the parties for further negotiation. By majority vote on each issue, make a determination and award which is final and binding on the parties for a period of time up to two years from the expiration date of any previous collective bargaining agreement. In response to employer criticisms, advocates of binding arbitration cite a study published by Cornell University’s School of Industrial Relations, which concluded that “wage increases awarded under arbitration matched those negotiated voluntarily by the parties” and that “wage changes in a national sample suggest wage increases differed little in states with arbitration from those without it.” Yet the first finding is self-evident: negotiated contracts will inevitably tend to line up with arbitrated settlements after a long period in which unions have been able to force disputes to arbitration, backed up by the “Triborough” guarantee that all provisions will remain in effect until a new contract is settled. As for the finding that arbitration doesn’t really result in bigger pay hikes: if that’s true, why do police and firefighter unions cling to it so tenaciously? And why have New York’s corrections officers, forest rangers and deputy sheriffs all lobbied to join them in the arbitration-eligible club? Figure 2, above, suggests an explanation. Since arbitration was first authorized in New York in 1974, inflation-adjusted average salaries for members of the state Police and Fire Retirement System (PFRS) have risen nearly three times faster than average salaries for other types of employees outside New York City. PFRS members, most of whom are arbitration-eligible police and firefighters, have the highest average salaries of any group of public employees in New York. A further breakdown by employer appears in Table 1, below. Several recent PERB arbitration awards to local police and firefighters unions in New York underscore the prevalent trend of retroactive pay increases combined with small (if any) adjustments to health benefit cost-sharing arrangements in the wake of the financial crisis and recession. In the following five cases, all filed with PERB since February 2013, arbitrators acknowledged the added fiscal stress caused by the downturn but said local financial conditions nonetheless indicated local taxpayers still had the ability to pay more than employers said they could afford. Village of Rockville Centrea– An arbitration panel awarded a retroactive 6.6 percent increase in base salaries to members of the police officers union in Rockville Centre, Nassau County, for 2010 and 2011. In addition, police won increases in both clothing allowances and longevity increases. The arbitrators’ lone concession to management in Rockville Centre was the addition of four steps to the pay scale for newly hired officers, meaning it will take four years longer to reach top base pay. But the panel voted 2-1 to reject the village’s proposals to increase the work year, to curtail severance pay, to reduce vacation and sick allotments, and raise health insurance contributions for new hires. With overtime and other extras, the village police force received an average annual salary of $141,384 before the arbitration award took effect, according to state pension records. Village of Briarcliff Manorb– Police officers were awarded a base salary increase totaling 5.7 percent, which represented about 70 percent of the pay hike they had sought for fiscal years 2010 and 2011.The panel agreed to require officers hired after May 2011 to contribute 10 to 15 percent of their health insurance premiums, effectively greater than flat rates paid by officers under prior contracts. However, the arbitrators also granted a longevity pay increase, saying it was warranted because Briarcliff police “earn the same or less than many of their counterparts in neighboring villages.” The average Briarcliff Police Department salary prior to the arbitration award was $110,152. Village of Pelhamc– Arbitrators granted Pelham firefighters a 5.8 percent pay hike for fiscal 2010 and 2011—which, as in the Briarcliff Manor case, was about 70 percent of what the union had sought. The panel granted a bigger raise to fire lieutenants, more than doubled union members’ dental benefits to achieve parity with comparable jurisdictions, and rejected the village’s proposal to change a “minimum manning” requirement. A concession to management was a reduction in holidays, from 13 to 12 a year, accompanied by an increase in the number of accrued sick days union members can give to each other. City of Albanyd– The union representing Albany city police sergeants and lieutenants retroactive base pay hikes totaling 6.14 percent for 2010 and 2011, without requiring the increase in employee health insurance contributions negotiated by the unions representing the city’s rank-and-file police officers. With the city’s representative dissenting, the panel concluded that Albany could afford higher pay because “it is not unreasonable to conclude that the city’s residents are not overtaxed.” In fact, as of 2010, Albany’s per-capita city tax burden (excluding school taxes) ranked 4th highest and its full-market average property tax ranked 26th out of 61 cities. Chemung Countye– For the two years ending Dec. 31, 2010, a unanimous panel awarded deputy sheriffs base pay increases of 5.8 to 6.8 percent, depending on step, along with a 10 percent hike in entry-level base pay. The panel also accepted the county’s proposal to raise a cap on health insurance contributions in order to maintain the employee share at the existing level of 12 percent. 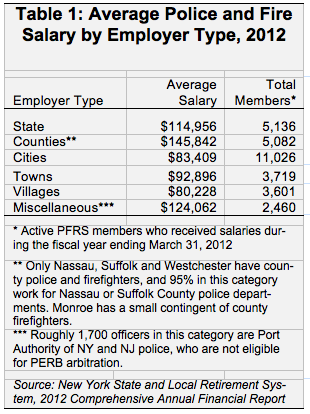 Arbitration has played a role in the build-up of large pay packages for county police officers, mainly on Long Island, whose average salaries topped $145,000 as of 2012, as shown in Table 1, below. Driven in part by decades of arbitration awards citing “comparables” in nearby communities, six-figure average salaries also have become the norm for city, town, and village police in most of Long Island, Westchester and Rockland counties. New York State Police—mainly state troopers—were granted the right to arbitration in 1995. Since then, their average salaries have more than doubled, to a 2012 level of nearly $115,000. In addition to base salary increases, police officers and firefighters also receive annual “step” increments for a number of years after they are hired, plus longevity pay when they attain designated seniority levels, plus holiday pay and night differentials. The Triborough amendment requires that step raises and increments be paid even after a contract has expired. Salaries are only part of the picture, however. Aside from pension contributions, which are controlled by state law, health insurance premiums are the fastest growing component of compensation for police officers and firefighters. Like most public workers, they retain lifetime health insurance coverage after retiring, but they also retire earlier—after as few as 20 years—and thus account for a disproportionately large share of massive, unfunded retiree health care liabilities in local governments across the state. In practice, while unions virtually never win the pay increases they propose (and tend to ask for more than they expect to get), the “financial ability of the employer to pay” is rarely cited by arbitrators as an obstacle to the granting of some level of pay increase—even in the wake of a severe recession. Police and fire pay was frozen in only four out of 136 arbitration awards since 2003, and employees in all cases continued to receive any step or longevity increases for which they were eligible. One-year pay freezes—for Oswego city and Nassau County police—were granted by arbitrators for 2001 only, when local finances were hit by the previous recession. A 2007 arbitration award froze base salaries for Niagara Falls police captains and lieutenants in 2004 and 2005, followed by 6 percent pay raise plus a $2,000 lump sum for the next two years. In the sole example of a freeze imposed via arbitration since the start of the recession and financial crisis of 2008-2009, arbitrators recently gave Oswego firefighters no pay increase for 2010, followed by a 2 percent hike in 2011. On the other extreme, in a December 2010 award to the union representing St. Lawrence County sheriff’s deputies, an arbitration panel chairman faulted the county’s leaders for seeking a wage and benefit freeze from deputies without seeking “even a small sacrifice from County taxpayers or other groups.” The panel gave deputies a total base pay hike of 6.12 percent for 2008 and 2009. Even including the handful of cases including temporary pay freezes, unions won at least some base salary increase in all 136 of the police, fire and deputy sheriffs’ contract disputes resulting in arbitration awards between 2003 and 2012, with annual increases averaging 3.6 percent through 2007 and 3.3 percent from 2008 to 2012. During the same period, PERB-appointed arbitration panels awarded at least small healthcare savings concessions to employers in 40 percent of cases (54 in total), including 38 awards involving some increase in contribution for new or existing employees. Employers also won some changes to healthcare plan design, dual coverage restrictions for family plans, and increases in drug co-pays. But two of the other factors arbitration panels must consider—compensation patterns among “comparable” jurisdictions, and provisions of prior contracts between the parties—make it more difficult for employers to win more significant cost-saving changes to employee benefits. For example, in a 2009 award, arbitrators rejected the town of Orangetown’s proposal to require its police officers to contribute to health insurance premiums on the grounds that this would put Orangetown “completely at odds … with all of the police jurisdictions in [Rockland] County.” In 2011, a panel chaired by a different professional arbitrator rejected the same change for police in neighboring Clarkstown, citing the pattern of non-contributory health insurance plans among other departments in Rockland County. The problem is that the “innovative potential of collective bargaining”—already hampered by Triborough—is more likely to be constrained when unions have arbitration as their ultimate fallback position. Like New York State, New Jersey allows its police and fire unions to seek binding arbitration of contract impasses. Also like New York, New Jersey has capped local property tax levies at 2 percent. To help local governments live within their tax caps, Governor Chris Christie and the New Jersey Legislature agreed in December 2010 to impose a 2 percent limit on salary increases awarded through arbitration, defining salaries to include steps and longevity increments (but excluding benefits). The law also accelerated the arbitration process, requiring decisions within 45 days. During 2011, the first year the cap was in effect, the number of new police and fire arbitration filings dropped by 81 percent, according to New Jersey’s Arbitration Impact Task Force. The Task Force attributed the decline to uncertainty over new arbitration procedural rules as well as to the cap itself. With New York’s arbitration law set to expire on June 30, Governor Andrew Cuomo’s 2013-14 Executive Budget included statutory language imposing 2 percent cap on compensation cost increases resulting from arbitration, defining “compensation” to include health benefits while excluding steps and longevity increments. As originally presented, Cuomo’s cap would have been limited to fiscally distressed municipalities. After the Legislature passed its own budget bills including a three-year extender of the existing arbitration law, the enacted budget did not include any provision addressing arbitration—leaving the issue open. More recently, Governor Cuomo has suggested he might create a “financial restructuring group” which could also serve as “an alternative binding arbitration panel for police and fire unions whose negotiations with a financially distressed city have deadlocked.” But he has not described the standards such a panel would apply, or explained how or why such an arrangement would be appealing to either side in a contract impasse. If Section 209.4 were to simply lapse, New York’s police and fire unions would be left to collectively bargain under the same rules that apply to other unionized public employees, such as teachers. But if the law is renewed in any form, the record of recent arbitrations suggests local governments need more negotiating leverage to control and reshape compensation costs—which would also give unions more incentive to negotiate such changes rather than seeking arbitrations. A 2 percent compensation cap for all employers, applying to step increases and longevity increments as well as base salaries and benefits, could accomplish this. Unions still opting for arbitration under this rule would effectively be left to choose between bigger pay increases and the preservation of costly benefits. Building on New Jersey’s precedent, such a reform would be further strengthened by including steps and longevity pay under the cap, by accelerating the arbitration process, and by requiring PERB to collect more data from employers on the terms and financial impacts of both negotiated contracts and arbitrated settlements. 1. State of New York, Governor’s Committee on Public Employee Relations, Final Report, March 31, 1966, as reprinted in Jerome Lefkowitz, Melvin H. Osterman and Rosemary A. Townley, eds, Public Sector Labor and Employment Law, Second Edition, New York State Bar Association (1998), 60. 2. The latest extension was included in the Tier 5 “pension reform” law, enacted in December 2010. 3. Since 1983, PERB has recorded only 41 strikes of government workers in New York. 4. Thomas Kochan, David B. Lipsky, Mary Newhart, Alan Benson, “The Long Haul Effects of Interest Arbitration: The Case of New York State’s Taylor Law,” Cornell ILR Review, Vol. 63, Number 4, p. 565. 5. E.J. McMahon and Terry O’Neil, Triborough Trouble, Empire Center for New York State Policy, January 2012. 6. Pension system data show that the 31,024 PFRS active employees as of 2012 were generally older and had more years of experience than the 30,685 employees on PFRS payrolls in 1974. However, during the same period, there was a proportionately similar shift to the higher-paid end of the seniority scale among ERS employees. Therefore, the vast disparity in average salary increases between PFRS and ERS employees cannot simply be attributed to changes in seniority alone. 7. Roughly 5 percent of PFRS members work for the Port Authority (PA) of New York and New Jersey, whose police officers are not subject to the Taylor Law. However, they have recourse to a similar form of binding arbitration through the PA’s own Employment Relations Panel. 8. E.J. McMahon, Iceberg Ahead, Empire Center for New York State Policy, September 2012. 10. State of New York, Civil Service Law, Article 14, Section 209.4(v). 11. City of Oswego & Lake City Police Club, IA2001-018, Oct. 7, 2003, at http://www.perb.ny.gov/pdf/ia2003-4/ia201-018.pdf, and County of Nassau & County of Nassau Detectives Association, Inc., IA201-026, March 9, 2005, at http://www.perb.ny.gov/pdf/ia2004-5/ia201-026.pdf. In the latter case, including a first-year freeze, detectives were awarded a total pay hike of more than 21 percent over five years. 14. By contrast, negotiated settlements involving other public employees appear to have resulted in more numerous pay freezes. For example, unions in at least 15 Nassau County school districts accepted base pay “zeroes” in 2011 alone. State employee unions negotiated a three-year base pay freeze and payless furloughs in their 2011 contracts. 17. Kochan, et. al., p. 582. 20. State of New Jersey, 2012 Annual Report of the Police and Fire Public Interest Arbitration Task Force, September 12, 2012. 21. Part Q of the Governor’s 2013-14 Education, Labor and Family Assistance bill, S.2607/A.3008. 21. “NY Ready to Help Its Towns,” Albany Times Union, May 1, 2013. Only 4 of 136 arbitrations—including just one since the latest recession—included a pay freeze in any year.